The full 27-page report is embedded below, if you can’t see it, please click directly to this blog post to access it. 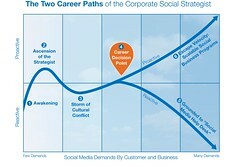 This Social Media Decision Maker Must Choose One of Two Career Paths. This emerging role is critical to the success of social media programs yet, most Social Strategists and their programs lack maturity, with only 23% of Social Strategists having a formalized program with long-term direction. They are overwhelmed with six major challenges – with little relief in sight: Resistance from internal culture, Measuring ROI, Lack of resources, An ever-changing technology space, Resentment and envy of the role, and A looming increase in business demands. With demands just about to increase, they have two possible career paths: 1) Fall behind in requests from vocal customers and internal business units, thereby becoming reactive which we call the “Social Media Help Desk”, or 2) Develop a proactive program that gets ahead of the demands, and operate from a strategic planning position. The more you spread it, the easier it is for me to produce more Open Research. This research was 100% funded by Altimeter Group, and we are releasing it under creative commons so you can use it in your planning, presentations and spread widely. Please spread it to your partners, clients, vendors, staff, embed on your intranet, corporate blog, executives and boss, just kindly provide attribution to Altimeter Group. Coming next: Forecast of Social Business for 2011. Thanks to the dozens who participated in the interviews, all those who participated in the survey, and some key advisors such as Gil Yehuda who provided a ‘third eyes’ review. A very special thanks to Altimeter’s core research team Christine Tran and Andrew Jones, Julie Viola for getting all the ducks in a row, and lastly Charlene Li, my editor for this report. Join the Discussion Below: How Will Strategists Avoid a Career in Help Desk? Let’s discuss the findings. Are you a corporate social strategist? Did this report reflect your career? How will strategists be proactive and get ahead of the incoming deluge of requests and escape a career in social media help desk? I’ll cross post to those that add to the discussion, I’ll link to the thoughtful critiques, even critical ones. Jason Falls: Gives a fair critique of what he liked –and didn’t like. Brian Solis covers the report in two sections, Rethinking the future of business part 1 and part 2: Building the framework. Social Media with orgs does a wrapup of many of the voices in the space. Jane Hiscock from Farland Group reflects on the research report, and adds a few more insights. Edelman’s David Armano reviews the report and gives his take, I was fortunate enough to interview him.